What is an Absolute Divorce? Absolute divorce is the term used for a simple divorce in North Carolina. Since N.C. is a No-fault state, the plaintiff doesn’t need to prove any wrongdoing of the other spouse to file for absolute divorce. Either spouse can obtain an absolute divorce provided they meet the requirements. In order to get a divorce in North Carolina, the court only requires two things: 1) that the couple has lived apart for at least 12 months without the need to show proof of the separation and 2) that at least one party to the divorce has lived in NC for at least 6 months prior to filing the divorce complaint. The only information needed to show separation is the date when the couple started living apart and that at least one party in the marriage intends the separation to be permanent. The marriage must not have resumed during the 12-month separation period. If the court finds out that the marriage has resumed within the separation period, the time will be reset to another 12 months in order to obtain a divorce. How Long Does it Take to Get an Absolute Divorce? The first step is filing a complaint. Once the complaint is filed, it needs to be served on the opposing party. Service can take up to two weeks. If you do not know where your spouse lives service will take much longer. Once your spouse has been served, you must wait 30 days before requesting the court hear your case. Generally, your case will be heard within 30 days of your request for a hearing. The divorce judgment will be signed at the hearing. The entire process usually takes 90 days. Immediate filing for divorce is not a requirement in North Carolina, and you may want to remain married while being separated due to beneficial reasons such as social security and health insurance. 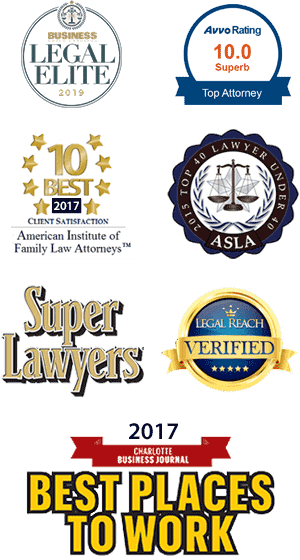 Our team of experienced attorneys can help you determine the proper timing for filing the divorce in such a way that your rights are protected. Can I file for Absolute Divorce Without an Attorney? Yes, you can file for divorce without an attorney, but you may not want to do it alone. You can view an example packet here. It’s best to consult with an NC divorce lawyer. If you’ve been served with divorce papers or a divorce complaint and you’re concerned about whether your rights are protected or waived, contact us right away to schedule a consultation. Remember, that a divorce judgment voids all claims for alimony and equitable distribution. This means that once the court grants your divorce, you cannot go back and ask the court to provide you with support or to divide your property or debt. You can resolve these types of issues in a separation agreement even during the one-year waiting period. To get an absolute divorce, one of the parties only needs to prove the following: (1) The plaintiff or defendant have resided in North Carolina for six months preceding the filing of the complaint for absolute divorce; (2) The parties are married; (3) The parties have been living separate and apart for one year preceding the filing of the complaint for absolute divorce; and (4) The parties do not intend to resume marital relations. For filing an absolute divorce in N.C. on your own, we have available forms in our forms bank for you to view. You may file for a divorce yourself but if you want to make sure you won’t waive any of your rights, it’s best to consult with an NC divorce lawyer. If a complaint for divorce has already been filed and you’re concerned about whether your rights are protected or waived, contact us right away to schedule a consultation. Is Divorce Ruining Your Finances?